Current recommendations in Australia and some other economies identify independent directors as a key component of effective corporate governance. The research on the empirical link between board characteristics and firm performance, matching the trend towards greater board independence, is growing; the mixed evidence, however, suggests the need for an in-depth investigation. In this study several theories, which make different predictions about the effect of board independence on firm performance and vice versa, are tested. 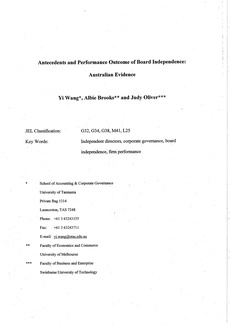 The results indicate that, for Australian listed companies, there is no strong relationship between board independence, and past or subsequent firm performance; it is reported that the level of board independence does not have any significant effect on firm . risk. The evidence casts doubts on the hope that promoting board independence would improve corporate performance. It is recommended that, despite agency theory's policy influence, whether certain corporate governance practices proposed-by the perspective would lead to better performance should be empirically tested.